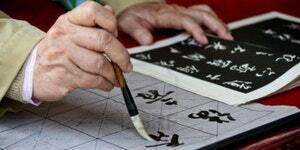 Professor Wang from the Chinese Calligraphy and Painting Learning Center will provide an introduction to the art of Chinese writing with brushes and ink. This class is for adults. The fall session will be held on Tuesdays, September 18 through December 18. Consistent attendance is highly recommended. Registration starts on Tuesday, September 4. Once registered, you are signed up for the whole session. Please arrive at class on time or your seat will be cancelled and released to the wait-listed or stand-by students at the library. Bring your own brush, paper and ink.